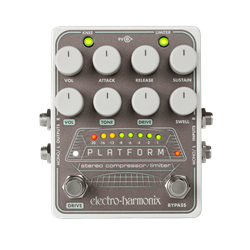 The Electro-Harmonix Platform pedal is a fully-featured stereo compressor/limiter that lets the user precisely tune dynamics regardless of the instrument or situation. It also includes a foot-switchable overdrive section with a full complement of controls and an adjustable volume swell function. Studio-quality compressor/limiter lets the user precisely tune dynamics regardless of the instrument or situation. compressor it produces a sound that's saturated, smooth and slippery. 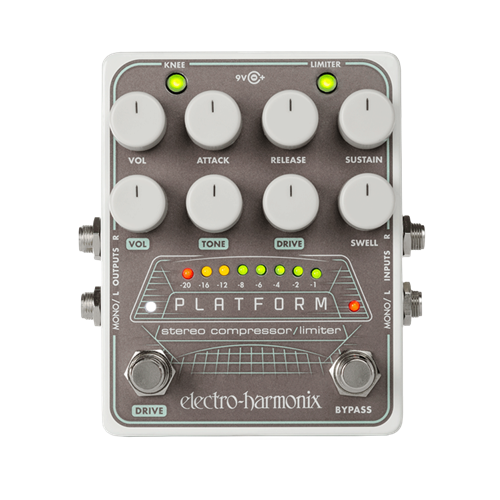 Features a three color, eight LED compression meter that displays the compressor's actual gain reduction in real-time. Stereo buffered bypass that's great for keeping your signal pristine with multiple pedal setups and long cable runs. Comes with an EHX9.6DC-200mA power supply.